The perfect time for the Toyota bB? The 2004-2006 Scion xB was a revolutionary vehicle in the U.S. It came from Japan with few differences from its Japanese-market counterpart, the Toyota bB. Yes, it's looks were polarizing, but it had (and still has) a devout following. It got people excited about "small." Suddenly it's 2009, and there are a couple of new players coming into the small car market. 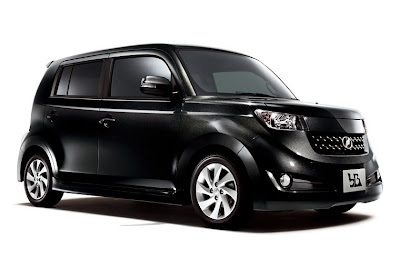 You've got one of the Japanese "big three," Nissan, launching it's funky Cube; and "most improved" Korean player, Kia, about to introduce its unique Soul to the market. Sure Scion has its current xB (introduced as a 2008 vehicle), but it's bigger, heavier, and thirstier than the new guys. Yes, Scion has its xD, but even the xD is in its second model year now, and although it's a nice vehicle, it just doesn't seem to jump out at me like the Cube or Soul. Suddenly, Scion looks like it's a bit ... dare I say ... dated? But maybe there's a solution. It just seems right for Scion to add perhaps another box to its lineup, and the current Japanese-market Toyota bB (as seen above) would be a great answer to the Cube, Soul, and other upcoming subcompacts. It's certainly different looking, but in a good way. It's the right size—about the same size as the original xB (and the Cube, and the Soul), and it's already got a good aftermarket in Japan, since it's been out for a couple of years already. Then again, perhaps it wouldn't meet U.S. safety standards, and it has been on the Japanese market since late 2005. And with Scion's current lineup, it might be hard to successfully integrate another boxy five-door into the brand, what with the xB, the xD, and even the Yaris in Toyota's camp. However, seeing what's coming down the pipe from competitors, including Ford, Chevrolet, possibly Suzuki, and others, it seems like Scion needs to do something to make it's fresh, hip image fresh and hip again. Maybe when the current xB's model run is up, Scion will decide to pony up with another amazing small vehicle; perhaps a refreshed Japanese-market Toyota bB? Hey, it worked the first time. I agree with you Scion needs to do something wacky and functional to keep the momentum going for Japanophiles(devoted fans of distinctly Japanese creations).Considering the thoughtful points you've made I think the bB would have a good chance if it came over as the Subaru Dex.Subaru needs to re-emerge with a new cult car and a re-badged bB might be the ticket.They don't have a subcompact or a delightfully weird car anymore so here's a new niche for them to get into to.But American auto journalists are already trashing the idea.I like the xd I think it's avant garde to a degree and a good quality car.But to many it is an xa in xb drag and that's probably not really fooling anybody.The Fuse concept car shows promise though. I think that there are much better small cars in Toyota's arsenal to bring over than the new bB. What do you think Toyota should bring over to compete against the Cube and Soul, Sparky? Aygo, Ractis, and Raum. I feel that these would be perfect for the original Scion Brand image that we knew and loved. I think the Aygo, while cool, won't come over due to the iQ's slated appearance in the U.S. I think the Ractis is a pretty neat vehicle ( was hoping the Ractis would come over instead of the current xD/Ist). I think the Raum is too ho-hum to be introduced as a Scion. It's got sliding doors ... I just think the bB is edgy, funky, and unique enough to stand up to the branding that Scion has been labeled with. FYI, here are the Web sites for the Aygo, Ractis, and Raum, respetively. The iQ will kill the US Aygo, I had forgotten about that. I feel that the Ractis would be my choice, Panda-style. The Raum would be cool for a Mini-Suv model, with some styling changes for US Market. Oooh, the Ractis is super cool looking. I think I've seen it before. Or maybe an older version of it. I dunno, it's one of those cars I think I've seen on the road but couldn't figure out what it's name was or who made it.